"No-one at that time had any sense how it would evolve. To imply anything else is misleading and dishonest." BBC Royal correspondent Sarah Campbell said Buckingham Palace was not denying the footage was authentic but that there were "questions over how this video has been released". Media captionThe Palace says the footage has been "exploited"
Who was the man in the video? Dickie Arbiter, a former Buckingham Palace press secretary, said the Palace would be investigating. "They'll be wondering whether it was in fact something that was held in the Royal Archives at Windsor, or whether it was being held by the Duke of Windsor's estate," he said. "And if it was the Duke of Windsor's estate, then somebody has clearly taken it from the estate and here it is, 82 years later. "But a lot of questions have got to be asked and a lot of questions got to be answered." Sun managing editor Stig Abell said he did not accept Buckingham Palace's accusation that the footage had been "exploited". He said the newspaper had decided to publish the story because it was of great public importance and the involvement of Prince Edward gave it "historical significance". Media captionRoyal Correspondent Peter Hunt: "Palace focusing on breach of privacy"
It's an arresting, once private image on the front of a national newspaper. Its publication has prompted Palace officials to talk about a breach of privacy and the Sun to argue it's acting in the national interest. Apart from the obvious anger on one side, it's striking how both sides have talked of the need to put the home movie in its "proper context". From the Palace perspective this is a six-year-old princess who didn't attach any meaning to the gesture. Such an explanation doesn't, of course, explain the thinking of her mother. 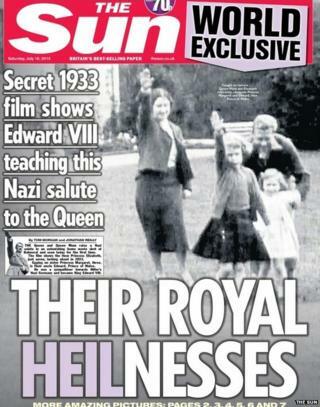 Those around the royals are also keen to focus on the war record of the then King, Queen and their two daughters. What they're less keen to focus on - and what the Queen would like not to be reminded of - is the behaviour of her uncle. A man, who was briefly King, and whose fascination with Nazi Germany is well documented. Mr Abell said: "We are not using it to suggest any impropriety on behalf of them. But it is an important and interesting issue, the extent to which the British aristocracy - notably Edward VIII, in this case - in the 1930s, were sympathetic towards fascism. Media captionSun managing editor Stig Abell: Video "should be shown"
"That must be a matter of national and public interest to discuss. And I think this video and this footage animates that very clearly." Mr Abell told the BBC the video was a piece of "social history" and said the paper had set out the context of the time and explained that the Queen and Queen Mother went on to become "heroes" of World War Two. He denied the video had intruded into the Royal Family's privacy. "I think this is a piece of social history. One of the most significant events in our country's history, the Second World War, the rise of Nazism, one of the most pernicious movements in human history, and I think one is entitled to have a look at some of the background to it." He added: "We're very clear. We're of course not suggesting anything improper on behalf of the Queen or the Queen Mum." The Queen was 13 when World War Two broke out and she later served in the Women's Auxiliary Territorial Service. In June she made a state visit to Germany where she visited the Bergen-Belsen concentration camp and met some of the survivors and liberators.